Have you had a look at our pre-made registration form templates? With the introduction of our new and improved registration form theme designer, we have also included many new templates that you can use as-is or customise to suit your needs. No design expertise needed! 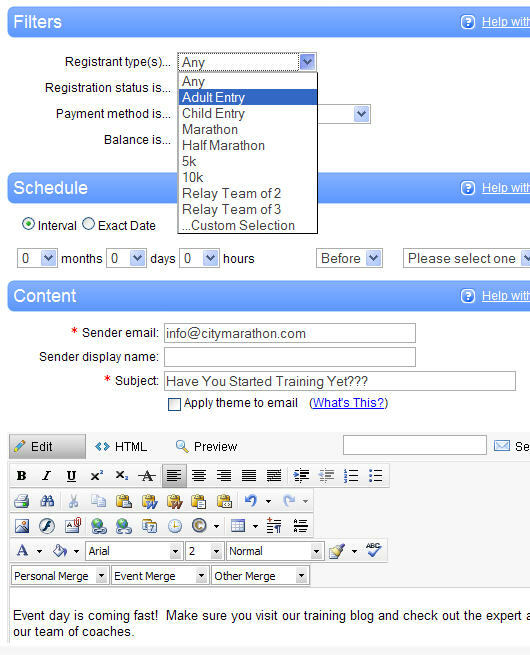 You can find the form designer and templates in the "Theme Designer" section of your event's ROL Manager dashboard. The Active Network, Inc. (NYSE: ACTV), the leading provider of organization-based cloud computing applications, announced today that the Company is the official partner of the Singapore Sports Council (SSC) at the upcoming Standard Chartered Marathon Singapore (SCMS) on Sunday, December 4, 2011. This year, Active Network is powering the SCMS 2011 official website and online systems, including the race registration portal which provides runners with an easy and convenient way to sign up for the race. This race is one of the largest and most popular running events in Asia. Registration opened to high demand, with more than 35,000 registrations in the first nine days – or an average of three sign-ups per minute. Online fundraising is quickly overtaking direct mail as the preferred method of collecting donations for charity events and non-profit organisations. As the younger "wired" generation grows up, we can safely assume that they will prefer to donate online almost exclusively. Are you doing enough to offer your donors and fundraisers the latest in online giving tools? Immediacy - The donor can learn about the cause and is enabled to make a contribution immediately while the thought is fresh in their mind. Administrative Efficiency - The non-profit organization receives the funds immediately along with donor contact information. Instant Gratification for the Donor - An acknowledgement is instantly sent to the donor by way of automatic confirmation email. Analytics - The key to successful fundraising is knowing who your donors are and what interests them. Collecting donations online allow you to observe their behavior in navigation of your website, track what they are reading prior to making the donation and what type of call-to-action resonates the most with them. Using this information to parse your contact lists will enable you to optimise your fundraising campaign by tailoring your message and call-to-action to different types of donors. Consider All Marketing Channels - Reference your online giving option in newsletters, brochures, your website, signage and radio/TV advertisements. Leverage Social Media - Sites like Facebook are cheap and effective ways to cultivate a word-of-mouth marketing campaign and grow your fan base. Your Website - Include your mission statement, goals, objectives and what work your organisation has accomplished to further your cause. Explain how you will use the funds you raise and include photos and testimonials from your fundraisers, donors and beneficiaries. Provide lots of ways to Donate...but focus on pushing the online channel. Collecting as many donations online as possible will automate your workload and minimise volunteer staff time and resources needed. Make your 'Donate Online' button large and above the fold (top half of the page). You have the attention of your audience and they are looking for a way to contribute as quickly as possible - don't make them hunt for a way to give. Reward Your Donors - Offer a gift or incentive in return for a donation. Consider something as simple as a subscription to your organisation's monthly newsletter or an invitation to a gala dinner for those who donate over a certain amount. Find a Robust Online Giving Platform - Choose an online donation service that allows your fundraisers to build a personalised fundraising web page. Enabling your fundraisers to build a personalised space online where they can add photos, their own personal story and blog about their experiences raising money for the cause will really get them excited to share with all their friends and family. Encourage Your Fundraisers - Offer prizes to fundraisers who collect the most donations. Many online donation services offer a way to track the total amount each fundraiser has gathered on their personal page from friends and family. Make it fun and get creative! With all of the relatively cheap (many times, free) online tools and marketing opportunities available nowadays, any organization can optimize their fundraising campaign. Build Your Email List – Your number 1 marketing priority should be maintaining and growing your email contact list. Email marketing is a highly effective and low-cost way of getting the word out about your event. Make it easy for your website visitors to subscribe to your email newsletter. On event day, make sure you provide a paper newsletter subscribe list when you are checking everyone in. Make sure when you design your email newsletters that you include a very clear call-to-action for the recipient to “Share this Email with a Friend”. Use Social Media – Build a Facebook page for your event and include references to it on your website and all marketing materials. Offer incentives for those who become a fan of your Facebook page. For example, offer a deal where those who are on your list of Facebook fans will receive a special commemorative t-shirt when they check in on event day. Your Facebook fans have their own circle of online friends who will notice their association with your event and naturally want to learn more. Provide Recruitment Incentives – Offer registrants a gift if they can convince their friends to participate. Group discounts are also a great way to recruit people who may be on the fence about attending. A common group discount would be a family deal where 4 people can attend for the price of 3. Offer Discount Coupons – With a down economy, if your potential attendees are on a tight budget, they may be thinking about waiting until next year to attend. Help them out and offer promotional coupons for a registration discount. Early-bird Registration Fee – Offer discounts for those who register early. Collecting more attendee data early in the registration process will also help reduce the amount of work for your staff in the last days prior to the event. Offer Online Event Registration – Registering for your event online can be as easy as just a few clicks saving your attendees a stamp or trip in the car down to the event office to submit their paper entry. Participant data and payment are collected instantly and a confirmation email is automatically sent out saving your staff time and resources. Send one Last Email Prior to the Close of Online Registration – Make sure to identify those email list subscribers that have not yet registered and send them one last reminder about 1 week prior to the event. Build Partnerships With Other Event Organisers and Clubs – Seek out other organisations that cater to the same types of people that would be interested in your event. If you’re planning a cycling event, do some research online to find all of the cycling clubs in the area. You may be able to work out an arrangement where the club manager will promote your event to his members if you in turn promote his club to your event participants. Host a Post-Event Festival – Considering how competitive the events industry has become, event organisers are doing everything they can to make their event stand out above the rest. One way of doing this is to host a party or festival after your event and offer additional activities beyond the main event. Activities could include a concert, prize draw, games for kids, booth space for your sponsors to hand out free samples or food tasting from local restaurants. Allowing your attendees to bring friends and family to the party is a great way to recruit new participants for the following year’s event. Make it a Fundraising Event – Your event is sure to provide your attendees with an unforgettable experience but why not also send them home with a feeling that that have done something for the greater good? Choose a local charity and donate a portion of event proceeds to the cause. If you want participants to be more hands-on, organise a fundraising competition and ask that they solicit their friends and family for donations. Those who are asked to make a contribution may also decide that they want to participate in the event. The Active Network team had a great time at the 30th deCastella Run. It took place on Sunday 29th August on Melbourne’s Yarra Blvd. Over 700 runners were greeted with a fantastic sunny day, which set the scene for the hilly and challenging course. Distances included 5, 10 and 15km, with the event raising money for Mental Health Research. Robert deCastella, one of Australia’s most successful marathon runners was in attendance, chatting with everyone and giving a pre race talk to all competitors. Event Apparel was provided by Splatt Merchandise, partner of the Active Network – it was a very exciting time for Splatt, with the deCastella Run being the first event in Australia to use the Splatt brand. Reports from Event Director Anthony deCastella have been extremely positive, with a large number of t-shirts and caps being seen on runners at training since the event! The Active team got inspired and had to participate! Fiona took part in the 15km event and was well supported by Jill and Tamara (who flew all the way from NZ!). We're all looking forward to next years event which will no doubt grow in attendance due to what a success it was this year! Online registration is now available for the Dow Live Earth Run for Water - Australia. The event, scheduled to take place in Melbourne Docklands on April 18 2010 will include a 6km run/walk to bring awareness to a very important cause. 6km is the average distance many women and children walk every day to secure water. The event will take place over the course of 24 hours in countries around the world and feature activities and education aimed at raising awareness of the growing global water crisis. Active is the proud provider of event registration software for the Live Earth Run for Water event - we are excited to be a part of such an important cause. For more information about the event please visit the official Live Earth website: http://www.liveearth.org. Web buttons have proven to increase entries by as much as 67%. Our registration form builder has a button generator feature that will enable you to custom design a "Register Now" or "Event Entry Here" button for your website. This feature is called "Button Designer" and is easy for any event director to use - No design experience required! We have found that using a bright and attractive web button increases entry form click through rates considerably. Give it a try and let us know how it works. We’re excited to announce that Dow Live Earth Run for Water has chosen to team up with Active and use our event management software to power their events. Live Earth will launch a series of 6km runs/walks that will take place over a 24 hours period, span multiple continents and raise money and awareness for global water shortages (6km is the average distance many women and children walk every day to secure water). The events will take place on Earth Day, April 18, 2010. 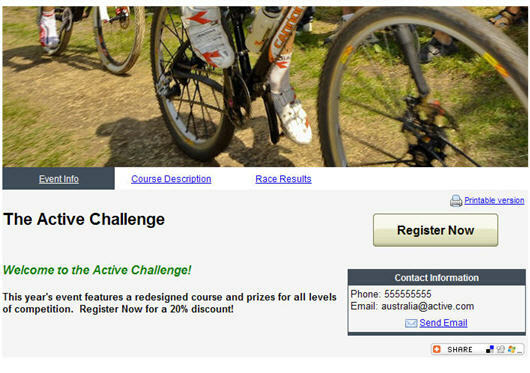 Active will provide secure online registration to Live Earth registrants and participants will have access to Active’s popular ActiveTrainer platform which is designed to help individuals create customised training plans to help reach personal fitness goals. In addition, participants will be using online fundraising tools that will allow individuals to create personalised fundraising pages and send donations directly to charities benefitting water challenges worldwide. For more information about the Run for Water and how you can register for an event in your area, visit www.liveearth.org. Slashed marketing budgets and a public that is saving their money for uncertain times could mean lower attendance rates for the events industry in 2009. We’ve talked with some of the industry’s top event organisers to see how they are beating the economic crunch. Across the board, the feedback we received shows that everyone is trying to accomplish one thing in particular: Increase attendance while lowering costs. This can be a real challenge but here are some low cost marketing ideas many are using that could also help you grow your event in a down economy. Minimise the amount of print advertising you are doing. Paper, ink and labor involved can be very expensive and oftentimes, it is very difficult to gage the success of a print advertising campaign. With a limited budget, you need to be able to show a return on every cent you spend on marketing. Email marketing costs nothing in materials and you have access to reporting that will instantly show your return on investment. The best advertising for an event is word of mouth. Social Media is a very low cost and effective way to create word of mouth on the internet. Make a presence for yourself in places like Facebook, Twitter, LinkedIn, and blogs or forums where the audience would be interested in an event like yours. If you have an official event website, you need to focus on Search Engine Optimisation (SEO). The goal is to get your website at the top of the search returns for keyword searches such as “Marathons in Melbourne” or “Australia Marathons”. With some small adjustments to your website, you can vastly improve your Google rankings. Just imagine all of the people out there searching for what you offer – they just don’t know about you yet! Collecting participant data online with an event management system will streamline your staff’s workload and open up more time that you can devote to all of the above. Many in the industry would say that having a custom website is essential to event promotion and growing attendance numbers. Once you make the initial investment, there are many low cost and highly effective ways to publicise your website and make it visible to the millions of people out there searching for an event like your own. The catch? It can be VERY expensive to have a website designed and built. The good news is that Active's event management software offers an affordable alternative. 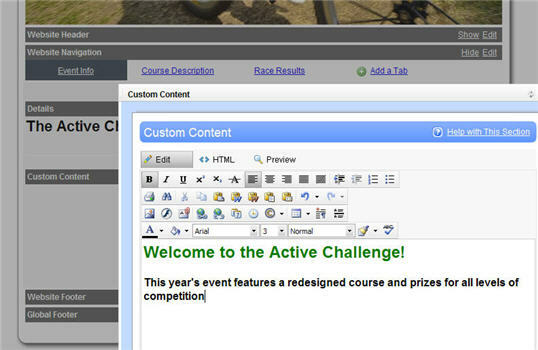 Build and customise your own event website with Active's website builder! This feature will allow any event organiser with little-to-no design experience to instantly build a custom entry level website. It's free, easy to use, and does not require the process normally needed to launch a brand new site. Our content management system makes it easy to build pages, add content, add images, and change the look and feel of your site's design and colours. Include a button that visitors can click to visit your online registration form. For more information about our website builder and premium website design, read more about our event marketing services. You may be hosting your first event or your 50th but in either case it’s a competitive events industry and you’re probably doing everything you can to stand out from the crowd. Having worked with many event organisers, our advice would be to not overlook the value of a solid event branding strategy. Your event name is something to be carefully considered and is probably the most important element in developing an event’s brand image. The name should not only fit well into your logo but it should also evoke emotion and be aesthetically pleasing on it’s own if printed in normal text in a newspaper or magazine. A slogan will help your audience remember your brand and commit it to memory. Your slogan should be short, clever and explain what the audience should expect when they show up on event day. A well branded event includes a custom designed logo. A custom logo will create a clear differentiation between your event and others. A logo should incorporate your brand name and slogan in a graphical representation of what your event is all about. Now its time to tie it all together. Everything from your website URL, invite emails, registration forms, advertisements, and venue decorations need to have consistent branding. Your goal is to burn the brand into the audience’s mind at every possible turn. If done right, your branding will create a great first impression, generate a buzz in the community, and make your event stand out above the rest. For more information about including your branding on your registration materials, you can read some more about custom registration forms. You may have already used Active's online event registration forms to collect attendee data and payment but have you had a look at our free website builder? Clients that collect online registrations through Active's event management platform also have access to a robust website publishing system. Plublicise your event with a free event website and include your event details, event images, event schedule, contact information, links to your sponsors, integrations with all the popular social media channels and more. Active enables you to instantly publish your free website to the web and submit it to all the major search engines - all with no hosting fees or experience with HTML code or web design needed. You can find the website builder in your Regonline manager. 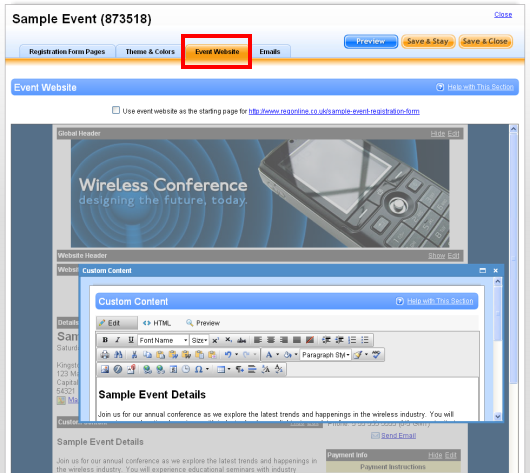 Select the event you would like to build a website for and click the "Event Website" tab on the navigation bar. Adding content to your website is as easy as using any word processing program. With Active's registration form builder, it's easy to drop your online registration form straight onto a page of your own website. 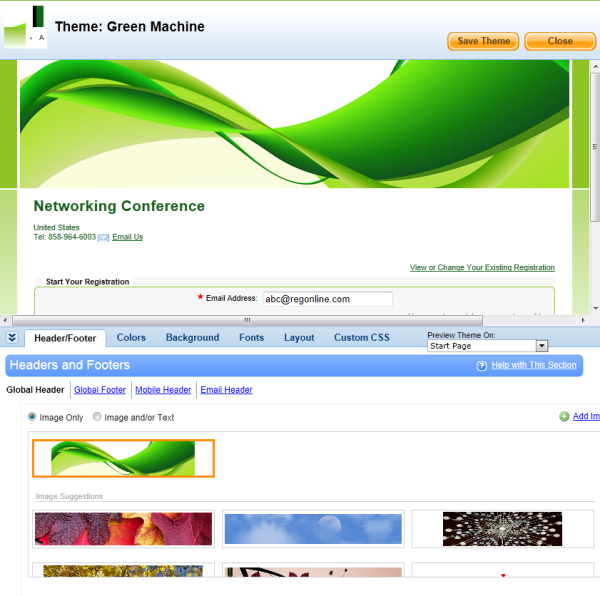 The technology is called "iFrame" and it's easy for any event organiser or their webmaster to use. Simply copy and paste this code into a page on your event website. The online registration form will frame itself on the page with all of the design and navigation elements that appear across the rest of your site. This feature is really great because the registrant will fill out the form without ever having to leave your event site! Keep your registrants engaged from registration date to event day with automated email follow-ups. Our event management software automatically sends a confirmation of registration to each of your participants but it is important to keep the communication going all the way up to the day of the event. Follow-up emails will keep your registrant’s anticipation level high and ensure that they show up to your event ready to have a great time. 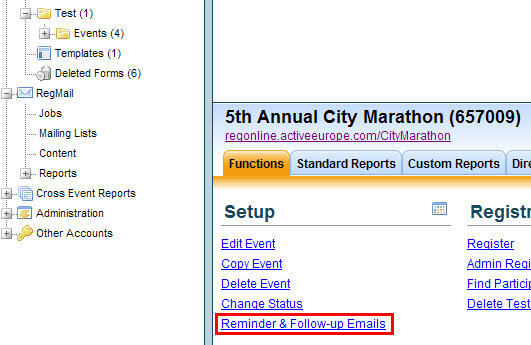 To schedule a follow-up email to your registrants, click on the "Reminder & Follow-up Emails" link under the Functions tab in your event manager. Next, you will see a list of reminder emails you have already scheduled. To create a new one, click the "Create New Reminder" link. Now select the registrant type you would like to send this email to, the time you would like to deliver it, and the content you would like to be delivered. That's it! Save your reminder email profile and let the system send it out automatically. You can come back at any time to cancel the reminder or edit it's content or the mailing list it will go to. 1. Develop an environmental impact statement. Include information on your website that showcases all of the earth-friendly things your event staff is doing to reduce the event's environmental impact. You may also want to choose an enviormental cause to focus on such as water preservation. 2. Offer online event registration as a way of conserving paper. Asking your attendees to use an online registration form will cut down the largest source of wasted paper for any event. 3. Do more event marketing online. Email marketing campaigns not only save paper but have proven to be more targeted and time-efficient than traditional "snail mail" advertising. 4. Reduce automobile emissions. If your participants or spectators will need a ride to get to another part of the course, hire a bus so that they can ride in groups. This will not only reduce carbon dioxide emissions but also give your attendees a chance to meet a new friend! 5. Use recycled materials. If you must print signs or forms, see if you can use a recycled paper. Even better yet, try to gather those materials back together after the event so that you can re-use them the following year. 6. Spread the word. Use your platform as an event organiser to spread your message. Your participants will leave the event proud of their accomplishments and a feeling of being part of a larger cause. Welcome to the Active Network Blog! We are pleased to welcome you to the official Active Network blog. Now you can stay up to date on the latest information posted by our team of event management gurus. You'll learn about product enhancements as we make them, we’ll frequently post event industry news and tips, as well as spotlight helpful resources that may be of assistance to your team as you plan your events. Expect to see posts from a variety of people on our team. Sometimes they'll be informal and brief; others will be more structured. We hope you'll find all of them useful.